Satisfying a myriad of regulatory compliance requirements and fulfilling obligations imposed by a wide range of standards, frameworks and guidance is a challenging task, but it is essential if you are striving for Principled Performance. Do you struggle with identifying standards, regulations and mandates that apply to your organization? Do you spend too much time trying to reconcile mandates across a range of sources, geographies and operations? Would you like a way to find clarity and simplicity in scoping, defining and updating your compliance requirements? Would you like to see how the GRC Capability Model (OCEG Red Book) maps to other sources of governance, risk and compliance mandates? Then you must attend our webinar on July 13th at 11 am est, introducing the Unified Compliance Framework and the UCF Common Controls Hub which will now contain Elements and Practices from the GRC Capability Model. How the UCF aggregates and harmonizes requirements applicable to your organization by extracting mandates from a range of authority documents and mapping them to established common controls. 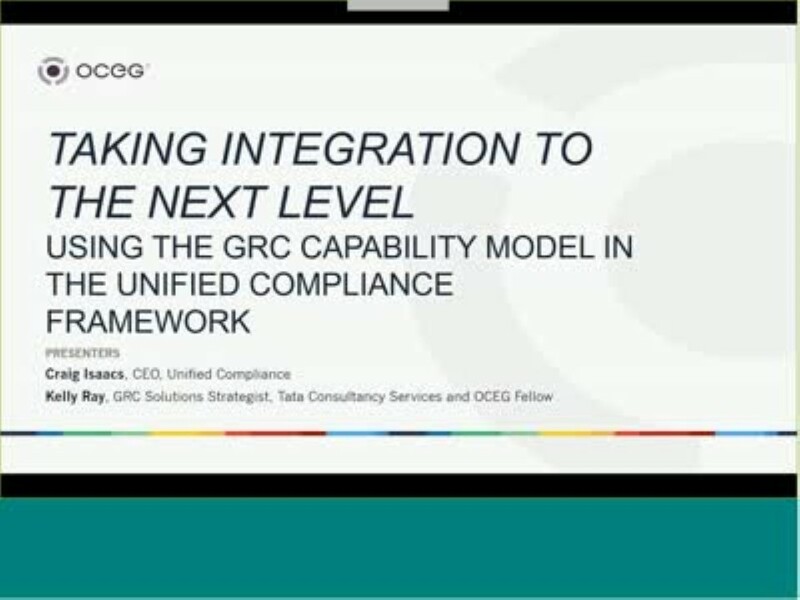 We have emailed instructions to access Taking Integration to the Next Level Using the GRC Capability Model in the Unified Compliance Framework to . Make sure the email arrives in your inbox: either add "support@oceg.org" as a safe sender to your email platform, or if you use Gmail, drag our email into your Primary tab.